Cameroon’s severe human rights crisis was brought to the fore in Toronto, Ottawa, and Montreal during the visit to Canada of Cameroon human rights lawyer, Felix Agbor Nkongho, at the invitation of LRWC. Mr. Nkongho’s visit was intended to increase Canadian awareness of the rapidly deteriorating humanitarian situation in Anglophone regions in Cameroon, which springs from historic marginalization of and discrimination against the Anglophone minority. Human rights abuses include summary executions of civilians by police and security forces along with mass arrests, arbitrary detentions and torture, and burnings of schools and houses. At least 180,000 people have been forced to flee and are internally displaced, while more have taken refuge across the border in Nigeria. Barrister Nkongho, the Executive Officer of the Centre for Human Rights and Democracy in Africa (CHRDA), was actively involved in organising non-violent civil resistance in late 2016 and early 2017 and was among lawyers who peacefully demonstrated in their court gowns and wigs to seek government reforms to address historic inequality against Anglophones. Many lawyers were beaten, and Mr. Nkongho was arrested, taken before a military court, and faced eight capital charges including treason, terrorism, incitement of civil unrest and breach of the constitution. Following an international outcry, including letters from LRWC, all charges against him were dropped. In a televised interview after his release, Mr. Nkongho thanked LRWC for intervening on his behalf. Mr. Nkongho spoke on the Cameroon crisis to a hundreds of lawyers, students, academics and others at talks in Toronto, Ottawa and Montreal. His visit included several media interviews, including segments on the CBC’s The Current, CBC Ottawa Today and TRTWorld. In Toronto, LRWC Director Gavin Magrath and Member Melissa Tessler welcomed Mr. Nkongho in a joint event with the Law Society of Ontario; the discussions are available by webcast through the LSO. Mr. Nkongho appeared as a witness before the Parliamentary Subcommittee on International Human Rights on 30 October 2018. He urged Canadian parliamentarians to assist in finding a solution to the grave human rights violations taking place in Cameroon. Mr. Nkongho believes Canada is well-positioned to assist because of Cameroon’s and Canada’s membership in the Commonwealth and Canada’s influence among Anglophone and Francophone countries. More information about the crisis and LRWC advocacy is available on the Cameroon page of the website. LRWC and the International Civil Liberties Monitoring Group (ICLMG) submitted a joint briefing, Canada’s failure to fully comply with the 2012 recommendations of the Committee Against Torture to the UN Committee Against Torture. The Convention requires states involved in torture to provide full redress by ensuring: an investigation to establish the facts and identify those responsible; public disclosure of the facts and acknowledgment of responsibility; an apology that restores the dignity, reputation and rights of the victim; and compensation. Canada’s failure to provide redress other than compensation ensures impunity for those responsible and promotes recurrences. In the Khadr case these failure have allowed persistent misrepresentations by Members of Parliament that have fueled public hatred and threats against the victim, and prevent full rehabilitation, reintegration and restoration of dignity. Although lack of funds prevented LRWC from attending the pre-session meeting with the Committee, our short oral statement was presented by a representative of the World Organization Against Torture – OMCT. Replies of Canada can be viewed on UN web TV. The Committee report on its review of Canada is expected in December or January. LRWC was invited to a round-table discussion in Ottawa on 29 November 2019 about consular services for Canadians abroad deprived of liberty and at risk. Catherine Morris was designated to attend the meeting, organized by the Parliamentary Secretary to the Minister of Foreign Affairs for Consular Affairs, which took place in Ottawa on 29, November 2018. In March LRWC submitted a report, entitled, Provision of Assistance to Canadians in Difficulty Abroad (Consular Affairs) to the Standing Committee on Foreign Affairs and International Development. The report, written by Catherine Morris, summarizes Canada’s international law obligations to ensure rights to life, liberty, freedoms from torture, enforced disappearance and hostage-taking, and access to effective remedies when these rights are violated abroad. Canada does not currently recognize consular protection or diplomatic intervention as the right of all Canadians subjected to grave violations of internationally protected rights. On 4 October 2018 the Attorney General of BC announced a review of legal aid service delivery in BC. LRWC filed submissions, The Right to Legal Aid: Recommendations for Reform of BC’s Legal Aid System in accordance with International Human Rights Obligations. Under international human rights law (IHRL) binding on Canada, legal aid is a right and states, including BC, have a mandatory duty to provide legal aid as a necessary component of a legitimate legal system that ensures equality before the law and the equal and non-discriminatory protection of the law. To fulfill that critical function, IHRL requires states to ensure legal aid in all criminal, civil and administrative proceedings to determine rights where legal representative is indispensable to a fair hearing. BC and Canada’s legal aid has been sharply criticized by UN treaty monitoring bodies, for more than 10 years, as inadequate and resulting in indigent, vulnerable and marginalized people being denied access to courts, legal protection, remedies for rights violations and fair hearings. LRWC wrote separately to the Attorney General requesting that the mandate of the review be expanded, which prompted a news article on 18 November 2018 by journalist Ian Mulgrew in the Vancouver Sun. A joint letter from LRWC, the Law Society of England and Wales and the International Bar Association Human Rights Institute was sent in November 2018 on behalf of lawyer Daniel Prado Albarracín. In response to the gravity of threats against Mr. Prado, the Inter-American Commission on Human Rights recommended that Colombia provide him with effective protective measures. Threats against Mr. Prado are apparently in reprisal for his legal representation of victims of crimes allegedly committed by the paramilitary group “The 12 Apostles”. Members of the 12 Apostles being prosecuted include Santiago Uribe Vélez, charged with murder, the brother of former president Alvaro Uribe. The joint letter asks that the threats be addressed with an investigation and prosecution of all suspected perpetrators and protective measures adequate to protect the life of Mr. Prado. On 1 March 2018, lawyer and head of the Egyptian Coordination for Rights and Freedoms Mr. Ezzat Ghoneim was detained on charges of membership in an unlawful organization. He was held in police custody for six months, even after a court ordered his release. On 14 September 2018, Mr. Ghoneim’s family went to visit him at the police station, where officers informed them that Mr. Ghoneim had been released. However, Mr. Ghoneim has not had any communication with his family and his whereabouts remain unknown. It is suspected he has been illegally taken into the custody of the National Security Agency (NSA), which puts him at a great risk for torture and other prohibited treatment. Mr. Ghoneim has been unable to adhere to the terms of his release, and the court has issued a warrant for his re-arrest for violating release orders. On 22 November 2018, LRWC (Mila van der Sluis) wrote a letter to the Egyptian government calling for the immediate disclosure of the whereabouts of Mr. Ghoneim, and his immediate and unconditional release. On 21 November 2018 prominent human rights lawyer Abdolfattah Soltani was conditionally released by Court order. He was most recently arrested in September 2010. In March 2012 he was sentenced to 18 years in prison and a 20-year ban on practicing law, for “propaganda against the system” and “assembly and collusion against the system.” That sentence was subsequently changed first to 13, then to 10 years in prison followed by first a 10 and then a 2-year ban on practicing law. Efforts earlier this year to secure release—a hunger strike in March and a parole application in July—were unsuccessful as was the 2013 ruling of the UN WGAD (A/HRC/WGAD/2012/54) that his detention was unlawful and immediate release required. Mr. Soltani has long been targeted with arbitrary detention and fabricated charges for his capable legal advocacy. LRWC has advocated on his behalf with letters and reports to the UN Human Rights Council and other monitoring bodies. See Iran: Wrongful Prosecution and Imprisonment of Lawyers, May 2014, Safety and Independence of Lawyers & access to legal representation, March 2014. The losses caused by his wrongful imprisonment are irremediable. Asia Bibi, a Christian agricultural worker, was sentenced to death by hanging in 2010 after being convicted of blasphemy under section 295-C of Pakistan Penal Code. The Lahore High Court upheld the conviction and the sentence in 2015, and Asia Bibi remained in prison for eight years. On October 31 2018, the Supreme Court of Pakistan overturned the conviction, setting off protests across the country. Leaders of the Islamist political party Tehreek-e-Labaik Pakistan (TLP) called for Ms. Bibi’s execution, and made threats of violence against Ms. Bibi’s lawyer and the Supreme Court justices hearing the appeal. To appease the TLP, the government agreed to keep Ms. Bibi in the country following her release from prison on 7 November. Due to the danger of extrajudicial death, Ms. Bibi has been relocated while the Supreme Court reviews a petition for review of her acquittal. Italy has offered Ms. Bibi asylum, while government representatives in the United Kingdom and Germany urge their leaders to do the same. Prime Minister Justin Trudeau has also suggested Canada will offer Ms. Bibi asylum, stating that Canadian officials are in discussions with Pakistan. Her lawyer, Saif ul Mulook, has fled to the Netherlands where he has been granted a temporary visa and the Dutch government has recalled staff from its embassy in Pakistan due to security threats. On 8 November 2018, LRWC (Hanna Bokhari) wrote a letter to the government of Pakistan, asking them to ensure the safe passage of Asia Bibi and her family out of the country. The letter also urges the government to provide protection for Ms. Bibi’s lawyer and the Supreme Court judges, and to renounce and take action against those who have issued death threats. Advocates for peasants’ labour rights, agrarian reform and land re-distribution, Yolanda Diamsay Ortiz, Eulalia Ladesma, Edzel Emocling, and Rachel Galario were arrested by the Best Operational Support Unit of the Philippine National Police (CIDG) and elements of the 7th Infantry Division. Emocling and Galario were charged with illegal gun possession then released on bail 17 October 2018. Ladesma and Ortiz were charged with possession of explosives, and remain in custody. LRWC wrote a letter urging the government of the Philippines to immediately release the detained activists and withdraw charges. The UN Working Group on Arbitrary Detention WGAD) issued a very strong and thorough opinion (A/HRC/WGAD/2018/10) that the arrest, prosecution, conviction and sentencing of prominent imprisoned human rights lawyer Waleed Abu al-Khair lacked any legal basis and were directed at restricting his freedoms of opinion and expression where there were not legitimate grounds to do so. The WGAD concluded that the prosecution, conviction and sentencing also violated the autrefois convict rule, that Waleed Abu al-Khair was the victim of discriminatory prosecution and the Specialized Criminal Court lacked the independence to conduct the trial. After finding that his detention was arbitrary under Categories I, II, III and V and violated the Universal Declaration on Human Rights articles 2-3, 6-13, 19-20 and 25, the WGAD recommended immediate release and compensation. Saudi Arabia has yet to comply. The WGAD Opinion was based on a complaint filed in April 2015 by LRWC, L4L, FIDH/OMCT, the Law Society of Upper Canada, the Law Society of England and Wales, HRW and IADL with LRWC as the lead. We are very proud of the decision. The Complaint can be viewed here and the WGAD Opinion is online. A group of UN Special Rapporteurs and Independent Experts are urging Saudi Arabia to immediately and unconditionally release all women human rights defenders, including six defenders who remain in jail on charges relating to their peaceful defence of human rights. Ms. Israa Al-Ghomgham was detained in 2015 for her involvement in peaceful pro-democracy demonstrations in 2011. Ms. Samar Badawi, Ms. Nassima Al-Sadah, Ms. Nouf Abdulaziz, Ms. Mayya Al-Zahrani, and Ms. Hatoon Al-Fassi – who had been particularly active in campaigning for women’s rights, including the right to vote and to drive – have been in pre-trial detention for the past four months. “We condemn in the strongest possible terms the actions of the Saudi authorities against these women human rights defenders and we call on them, as a matter of urgency, to immediately release and drop the charges against all of them,” the experts said. Read the full statement here. Over 160 civil society organizations have published a statement calling on the international community to take immediate steps to hold Saudi Arabia accountable for grave human rights violations. Saudi journalist Jamal Ahmad Khashoggi’s murder in the Saudi Consulate in Istanbul on 2 October is only one of many gross and systematic violations committed by the Saudi authorities inside and outside the country. The statement also points to the rampant arrests of human rights defenders, including journalists, scholars and women’s rights activists; the potential imposition of the death penalty on demonstrators; and the findings of the UN Group of Eminent Experts report which concluded that the Coalition, led by Saudi Arabia, have committed acts that may amount to international crimes in Yemen, as evidence of Saudi Arabia’s gross and systematic human rights violations. The 160 organizations urge the UN to convene a Special Session of the UN Human Rights Council on the recent wave of arrests and attacks against journalists, human rights defenders and other dissenting voices in Saudi Arabia, and to suspend Saudi Arabia from the UN HRC. The full statement can be read here. Amnesty International reported on 20 November that human rights defenders Samar Badawi, Loujain al-Hathloul, Iman al-Nafjan, Aziza al-Yousef, Nassima al-Sada, Mohammad al-Rabe’a and Dr Ibrahim al-Modeimigh, all arbitrarily detained in Dubhan Prison, are being “repeatedly tortured by electrocution and flogging, leaving some unable to walk or stand properly.” LRWC called on Global Affairs Canada on 21 November to use diplomatic means to secure the safe release of the victims. LRWC advocacy on behalf of Samar Badawi can be viewed online. LRWC has sent a fourth letter to the Government of South Sudan asking for information about the disappearance of Sudanese human rights activists Dong Samuel Luak and Aggrey Idri. The two men were detained in Nairobi in January 2017, and taken to a prison facility at the National Security Service (NSS) headquarters in Juba, South Sudan. Eyewitness reports confirm that they were removed from this facility on 27 January 2017. These men have not been brought before a court and the reason for their detention is unclear. To this day, their whereabouts and fate remain unknown. LRWC is calling on the Government of South Sudan to disclose the whereabouts of Mr. Luak and Mr. Idri, and to make public the reasons for their continued detention. Previous letters from LRWC on this case can be viewed here. LRWC is concerned about the systematic practice of arresting, detaining and prosecuting lawyers who represent opposition politicians in Tajikistan. In August 2018, Shukhrat Kudratov was released after three years in prison on charges of bribery and embezzlement. Prior to his arrest and detention, he was representing Mr. Zaid Saidov, who was seeking to start a new opposition party prior to the December 2013 elections. Since Mr. Kudratov’s release, he has been visited by the police at least six times with no explanation given. Several lawyers have also been forced to leave the country because of reprisals taken against them for legally representing opposition politicians, and others remain in prison or under house arrest. In a joint letter, LRWC, L4L and the Law Society of England and Wales urged the government of Tajikistan to comply with international law obligations and to ensure lawyers can continue their work without fear of judicial repercussions. On 7 November 2018, a Turkish court postponed the trial of eleven human rights defenders until March 2019. The accused include Amnesty International Turkey’s former director Idil Eser and its honorary chair Taner Kilic. All eleven are accused of terrorism charges, and spent several months in prison before being released. The trial has now been heard in six separate hearings, with much of the evidence having been disproven in the previous five. However, Turkish authorities are determined to prolong the trial as the government continues to prosecute people allegedly involved in the attempted coup 15 July 2016. LRWC has written several letters to the Turkish government calling for the charges against Idil Eser and Taner Kilic to be dropped. LRWC contributions to global advocacy, including participation in the 39th session of the UN Human Rights Council in September 2018, has contributed to the adoption of resolutions on Yemen and Myanmar by the UN Human Rights Council and the General Assembly. LRWC advocacy at the Human Rights Council includes continued advocacy to address widespread and grave human rights violations by several current members of the UN Human Rights Council, including Saudi Arabia and China. Myanmar: LRWC’s oral statement to the Council on Myanmar in September contributed to ongoing advocacy by numerous human rights organizations and States to end crimes against humanity in Myanmar’s Rakhine and Shan States, and suspected genocide against the Rohingya in Rakhine States. LRWC’s statement urged “all States to seek a General Assembly resolution for an international mechanism to gather and preserve evidence of genocide and other atrocity crimes in Myanmar, to enable prosecutions of those responsible.” The Council adopted such a resolution (paras 22-30) during its September 2018 session. On 16 November 2018 the 3rd Committee of the UN General Assembly passed a draft resolution affirming the Council’s resolution. It is expected the General Assembly will adopt the resolution in December 2018. Yemen: LRWC was among the human rights organizations and States that successfully advocated for a resolution adopted in the September session of the Human Rights Council extending the mandate for investigation of violations of international human rights and other international law during Yemen’s armed conflict. The situation in Yemen is considered “the worst humanitarian crisis in the world with more than 22.2 million in need of humanitarian assistance.” At least 6,475 civilians were killed and more than 10,000 injured between March 2015 and June 2018. LRWC’s oral statement noted that majority of civilian casualties since September 2014 “have been caused by the Saudi Arabia-led coalition air strikes on residential areas, markets, funerals, weddings, detention and hospital facilities, and civilian boats.” The Saudi coalition’s refusal to suspend naval and air restrictions has, as of April, left 17.8 million food insecure and 8.4 million on the brink of famine. On 12 October 2018 18 new members were elected to the UN Human Rights Council with membership to begin 1 January 2019 for three years. The 47 seats on Council are divided geographically as follows: 13 members from African States; 13 members from Asia-Pacific States; 6 members from Eastern European States; 8 members from Latin American and Caribbean States; and 7 from Western European and other States. The latter category includes the US and Canada. Memberships expiring at the end of the year are: Burundi, Georgia, Belgium, Cote d’Ivoire, Ecuador, Kyrgyzstan, Slovenia, Ethiopia, Mongolia, Panama, Switzerland, Kenya, Venezuela, Philippines, Korea, the UAE, and Germany. Many NGOs including LRWC have lobbied with reform of the election process to prevent no-choice slates and require nominated states to agree to comply with specific human rights standards during membership on Council. The International Service for Human Rights has published a ‘scorecard’ for each State elected to the UN Human Rights Council. These scorecards offer a quick summary of a country’s cooperation with the Council, their support for civil society and their engagement with UN treaty bodies and Special Procedures. The scorecards for the 2018 election can be viewed here. On October 25th, LRWC and the Law Society of Ontario (LSO) hosted Barrister Felix Agbor Nkongho for a discussion about the current humanitarian crisis in Cameroon which was held before a sold-out crowd at the LSO’s Donald Lamont Education Centre. More than 400 more joined through the live webcast of the event. 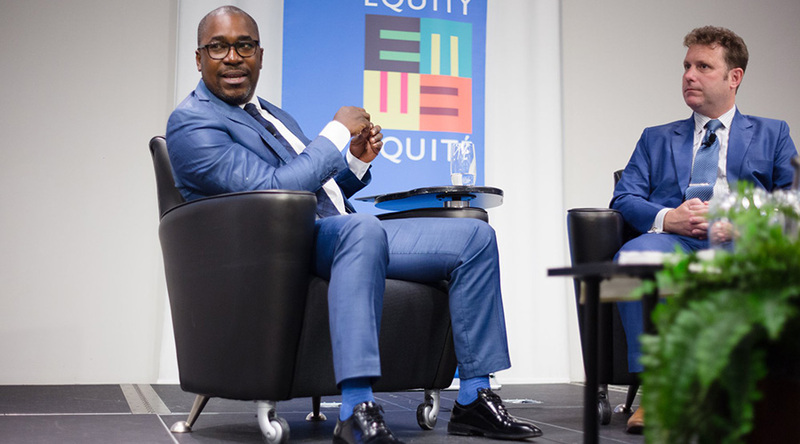 Events featured presentations by Mr Nkongho were also hosted by the University of Ottawa Human Rights, Research and Education Centre and the McGill University Centre for Human Rights and Legal Pluralism. UBC students of POLI 464A and Amnesty International/Canada hosted a panel discussion on human rights in the Middle East on 29 November at the Lui Institute for Global Affairs at the University of BC. Featured panelists were: André Elias Mazawi; UBC Professor: Maya Duvage, LRWC Monitor for Saudi Arabia; Atiya Jafar; friend/activist of Loujain al-Hathoul; and Ely Bahhade, UBC Masters in Journalism student. LRWC advocacy on behalf of Saudi Arabia HRDs can be accessed here. Hanna Bokhari, Temisan Boyo, Maree Bullivant, Paul Copeland, Gail Davidson, Maya Duvage, Pinder Cheema Q.C., Pearl Eliadis, Sebastian Ennis, Farhad Ghaseminejad, Robert Lapper, Gavin Magrath, Catherine Morris, Michael Mulligan, Felix Agbor Nkongho, Clayton Ruby, Paul Scambler, Paul Schabas, Margaret Stanier, Melissa Tessler, and Mila Van der Sluis.